Friday was a good day for me, I had time to catch up on some of my reading. I subscribe to 3 different Catholic newspapers and 3 different magazines, two Catholic and one political. The problem is time, when do I have time to read them all. Well Friday night I was able to slam through all the newspapers, than Saturday a new one arrived… UGH! But such is life. The Catholic presence in the word is growing significantly, according to a recent edition of the Statistical Yearbook of the Church. the Vatican Publishing House released information for 2000-2008 period, which showed the number of Catholics increased worldwide, but in some areas, the number of priest is not keeping up. That’s an over all 72.1% increase in Catholics and a 45.9% increase in Priest. Overall that good, but looking at the numbers we see that the Europe and Oceanic numbers are falling in the priesthood and Europe is hardly growing at all in the over all Catholic category. America is growing in the number of Catholics but holding still on new priest. The good news is we are not falling, we have not gone in to the negative yet, but the possibility exist. I have a friend who figures the growth of the priesthood is due to the economy, in the countries were the poor outnumber the middle class and wealthy, that the priesthood is an attractive “career”. The thought to me is a little uhm, anti “called to the priesthoodish” for me but she holds to this idea. But to her the priesthood is really nothing more than a men’s club. the priesthood is not a calling as much as an escape from the economic hardships and a way to provide for yourself in what would be considered a good career move. Cynical at best and down right scandalest. But its her point of view. To me, well I look at it this way, the fall of the calling to the priesthood is a human condition. God has not stopped calling, we have stopped hearing. At one time, in America as well as Europe, the call to the priesthood was considered noble and honorable. It was something that every Catholic family wished for and prayed for. That their little boy would grow up to become a priest. What an honor for the family. that family prayer was heard by God, and God would call the ones he chosen. The local parish would support and nurture the youngster and help develop his discernment skills. And the young lad would be encouraged to consider the priesthood. In today’s world if you were to say to a young Catholic lad that he should consider the priesthood he would look at you as if you were on drugs, the parents would ask you why you would say such a thing and the local priest would do all he could to discourage the lad. Now this is not all parents or priest or even parishes, but sadly it is most. Notice that all the statements begin the same “I want”, none of them began with “God wants”. This is the main issue, we have become a society that places our needs before Gods wishes. We have taken our trust in Him and placed it in ourselves. 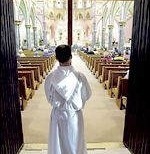 God calls young men to the priesthood daily, God knows what is best for us and He knows were we need to be in our lives. We only have to allow Him to speak to us, and for us to hear His call. The priesthood will survive, as will that Catholic Church. America and Europe along with the rest of the world will continue to grow in the faith and one day we will figure out that the problem of the lack of priest is not the economy of the country but the economy of the soul. Romans 8:1-2“[Life Through the Spirit] Therefore, there is now no condemnation for those who are in Christ Jesus, because through Christ Jesus the law of the Spirit of life set me free from the law of sin and death.”Brought to you by BibleGateway.com. Copyright (C) . All Rights Reserved. This entry was posted in Called by God, catholic, church, faith, growing up, prayer, youth and tagged Africa, america, areas, Asia, career, category, catholic, catholics, church, Cynical, discernment, edition, Europe, faith, figures, friend, Friends, grandparent, growth, hardships, house, human, kids, Life, magazines, money, needs, news, newspapers, Notice, numbers, Oceania, Oceanic, Overall, paper, parents, parish, percentages, period, places, prayer, Priest, purpose, response, skills, Snapshot, snapshots, soul, statements, Statistical, Vatican, Visitor, wife, wishes, word, world, Yearbook, youngster. Bookmark the permalink.